1. Place sealed cans of Earth’s Finest Organic Coconut Cream in the refrigerator overnight. Without shaking the cans, open and scoop out the thick cream sitting at the top over the water. Transfer the cream to a bowl and discard the liquid left in the cans. 2. Add the sweetener and beat on high using a hand mixer (or whisk) until thick and creamy (about 1-2 minutes). Reserve about 4 tablespoons of the plain ‘whipped cream’ to use as a topping to serve with (optional), and set aside. 3. Fold the cocoa powder and salt through the cream and beat (or whisk) again until smooth, well combined and thick. Fold through the shaved chocolate. 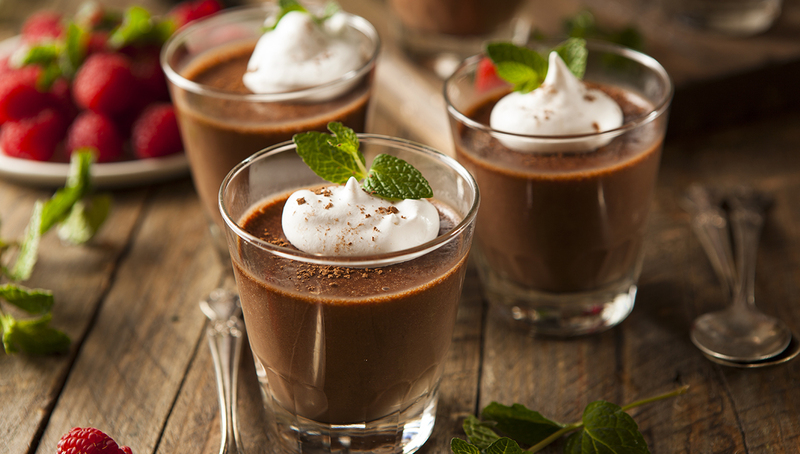 A mousse will form almost immediately once the cocoa powder is mixed through. If not, refrigerate until set and ready to serve, or serve immediately. 4. Dollop the Earth’s Finest Coconut Cream over the mousse and sprinkle with shaved chocolate (if using).